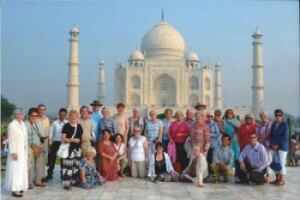 This is a wonderful opportunity to join us to explore the very best highlights of India at a very special price. From the hustle and bustle of the north to the peaceful backwaters of Kerala. All escorted excursions are included on this 19 day half board holiday which we have arranged with our friends at Travelsphere. We shall be staying half board in excellent 4* or 5* hotels + a Lodge and 2 nights in flight. Single Supplement: – £850 – This will be a double/twin room for single occupancy. Visa: Travelsphere can arrange this for you for a cost of approx. £105 per person or you can do this yourself on-line where the cost is approx. £94 per person. Travel Insurance: – Worldwide Travel Insurance is needed for this holiday. Passport: You will need a 10 year passport with validity of 6 months after return to the UK. Protection: For your peace of mind and financial protection Travelsphere is fully ATOL and ABTA bonded. Depart on your scheduled flight to Delhi today. On arrival in Delhi this morning we’ll transfer you to your hotel. Your sightseeing starts in the 17th century walled city of Old Delhi. Here you’ll delve into a maze of crowded streets and vibrant markets, and stroll through the fabled street bazaar of Chandni Chowk. We’ll stop to admire the marble domes of Jama Masjid Mosque before visiting the Gandhi Smriti Museum and Humayun’s Tomb. Your day is filled with wonderful experiences, starting with a short tour of Paharganj, in central Delhi. You’ll do this in the company of former street children, who now work with the Salaam Baalak Trust. This charity equips the youngsters with a range of skills and helps them to better their lives. Next you’ll tour New Delhi, where highlights include the India Gate, Parliament House and the Qutub Minar, a soaring sandstone tower. Our next base is going to be Agra, which we’ll reach by road. Today is the day that you’ll see one of India’s most famous landmarks, the incredible Taj Mahal. 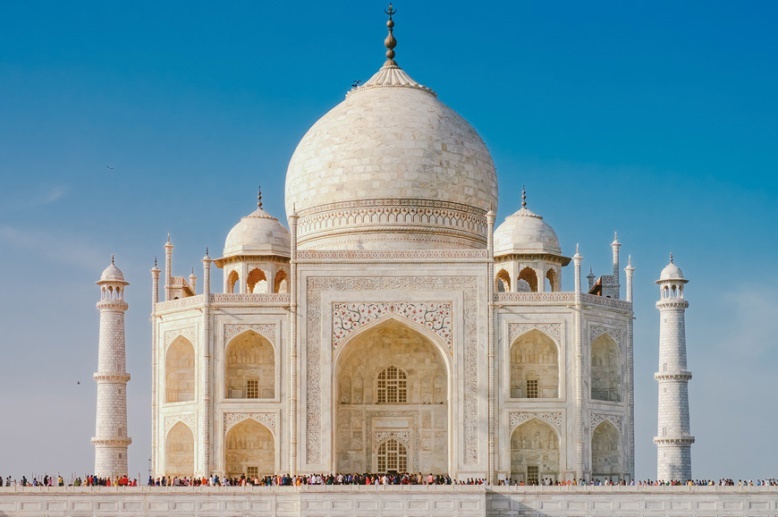 This mausoleum on the banks of the Yamuna River was built by Emperor Shah Jahan for his wife Mumtaz, and it’s a sight that will take your breath away. ** Please note: Vital restoration work is now being carried out on the Taj Mahal and will be completed in November 2018. Close by is Mehtab Bagh, a centuries-old garden complex, which sits on the other side of the river and is exactly aligned with this iconic masterpiece. You’ll get to see an alternative view of the Taj Mahal from here. Later, you’re going to visit the red-sandstone Agra Fort. Today we’ll drive to the deserted city of Fatehpur Sikri for a stroll through its pavilions and palaces. We’ll then travel by train to Modhopur, and transfer from here by road to Ranthambore. An exciting day is on the cards, with morning and afternoon safaris in Ranthambore National Park, said to be the best game reserve in India. We’ll make our way through thick forest interspersed with pretty waterfalls, which provides the perfect habitat for more than 300 species of birds. With the help of a Local Guide we’ll look for wildlife including crocodile, hyena, jackal and more. If you’re lucky you may spot the elusive tiger or the even rarer leopard. Your grand tour continues this morning as we drive to the ‘Pink City’ of Jaipur, with a stop en route in the village of Abhaneri. Here we’ll admire the unique carved stepwells, an ancient water storage system constructed to provide a water supply during dry periods. Jaipur’s City Palace is your destination this morning, with the elaborate façade of the Palace of the Winds just one highlight. A morning of discovery takes you to the Amber Fort, a 17th century stronghold set high on a hill above the parched desert. Step inside to see the Temple of Kali, the Palace of Mirrors and the Hall of Pleasures. In the afternoon, we’ll fly to Bangalore. If you choose to head out to explore you’ll find many western-style bars and restaurants as well as traces of the city’s former British colonial past. We’re heading west to Hassan today. This is the oldest town in Karnataka, and it is located close to one of India’s coffee-growing regions. Spend your afternoon exploring the temple towns of Belur and Halebid on an included excursion. En route to Coorg this morning, we’ll drive into the heart of coffee country. We’re going to spend the afternoon at the Tibetan settlement of Bylakuppe, which is home to monasteries and temples including the spectacular Golden Temple. A day of discovery starts with a visit to Madikeri Fort, Omkareshwara Temple and Abbey Falls. Later, you’ll find out all about coffee production on a plantation tour. The fabled city of Mysore is our next destination. You’ll head out on a tour this afternoon, with fabulous sights including the opulent city palace. We’re going to head back to Bangalore by road today. En route we’ll visit Srirangapatnam, the island fortress of the warrior King Tipu Sultan. 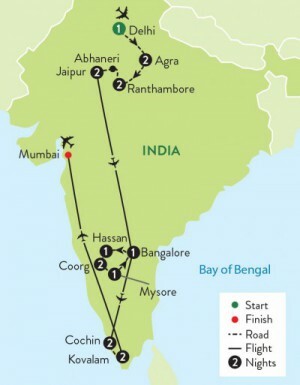 From Bangalore we’ll fly to Cochin in Kerala. We’ll get to know Cochin on a morning tour, with highlights including the Jewish Quarter, the Dutch Palace and St Francis Church. This is where Portuguese explorer Vasco da Gama was originally buried. A wonderful treat today is a cookery demonstration, with lunch included, and we’ll also see a display of Kathakali classical dancing. Kovalam is our final base, and en route we’re going to enjoy a lovely cruise on Kerala’s tranquil palm-fringed backwaters. You might choose to enjoy some ‘me’ time today on the beach. Perhaps you’ll get the chance to watch as the fishermen haul in their huge nets. Today we’ll fly to Mumbai, where there’s time for a short tour and dinner before we transfer you to the airport for your flight back to the UK. You’ll arrive back in the UK today . Every hotel you will stay in on your holiday is hand-picked by Travelsphere. We relish the challenge of finding the right accommodation for each and every tour, whether it’s chosen for its location, its facilities or its downright quirkiness. ENTERTAINMENT – 40″ LED TV and sound to personalise your entertainment. With its modern architecture and timeless appeal, this is more than a hotel—it is a destination. Located on 4.5 acres of land in the heart of the business and leisure precincts and within walking distance of the Taj Mahal, our hotel in Agra, India proudly offers everything that savvy international travellers have come to expect in cutting-edge accommodations. Guests will enjoy such amenities as flat-screen TV, safe, and large work desk in all rooms. TV, mini-bar, hairdryer, safe and tea/coffee-making facilities. The hotel boasts of a rooftop swimming pool. Spend some quality time with like-minded people along with some fine beverages and a wide range of Tandoori snacks, Continental, Thai and Mexican cuisine at our Salsa Lounge Bar. Hoysala Village, is a botanical wonderland. Elegantly designed and tastefully decorated with a variety of artefacts, constructed with rosewood and traditional materials, while trees and flowers line pathways, Hoysala Village Resort keeps you astounded. The 5-star Windflower Resort & Spa is ideally located in Coorg, surrounded by three wildlife sanctuaries and a national park. Hotel facilities include a restaurant, spa and a swimming pool. Bedrooms have private facilities, air-conditioning and a TV. With welcoming amenities like a modern fitness centre and free Wi-Fi, the Country Inn & Suites in Mysore invites you to rest and recharge during your stay in Karnataka. Whether you’re looking to energise your morning with a workout in the fitness centre or unwind in the evening with a swim in the outdoor pool, the Country Inn & Suites offers an attractive array of services designed to meet your needs and there are 3 restaurants on site. The 4-star Trident Hotel is situated in Cochin. Hotel facilities include a restaurant, bar and a swimming pool. Bedrooms have private facilities, safe, hairdryer, tea/coffee-making facilities and a TV. Uday Samudra Hotel is located just 15 meters away from the famed beach of Kovalam. The hotel is equipped with Wi-Fi, laundry facilities and tea/coffee-maker. The hotel also has spacious lawns, a harmony of architecture, blue water pools and soaring coconut grove in four tranquil acres by the sea.